U.S. President Barrack Obama's incessant push for a better healthcare sector in U.S. will be the silver-lining for the staggered IT service sector in India, as it unveils a multi-biilion dollar opportunity. Obama has allocated $37 billion of stimulus funding to drive the adoption of EHRs and as per McKinsey estimates the resulting growth in EHRs will require an overall spend of $175 billion. The EHR rollout will need the Indian IT firms' deep expertise in services such as systems integration, application management and legacy modernization, as the established software vendors lack the manpower to provide the services. Nearly, $50 billion of the spending will be devoted to IT services and training. The second big opportunity for Indian firms lies in BPO. The reform will see an influx of over 30 million newly covered individuals; insurers will look to outsourcing partners to help them enroll new members and process their call and claim needs. The rising cost pressures will force insurers and hospitals to concentrate only on a few core functions (such as benefit and services design, sales and marketing). The rest of the back-office services like member database management, claims processing and support services - enrolment processing, will be outsourced. The final opportunity hold big for the players in the data analytics market. These could range from comparative effectiveness research into different treatments or drug combinations to analysis of call, claims and clinical data for customer lifecycle needs and marketing. McKinsey estimates that the overall market for 'real world data' analytics could be worth over $10 billion. Wipro Ltd, India’s third largest provider of software services, is seeking a buyer for its Sophia Antipolis centre, said Christophe Martinoli, country head for France at the company’s Wipro Technologies business. “We have been always looking for buyers and we will continue to look favorably on any proposal that we may get from interested parties willing to continue part” or all of the center’s activities, Martinoli said in an email interview on Thursday. The facility, one of the Bangalore-based company’s five offices in France, employs about 60 workers. The company has told the French government that it will try to redeploy workers from the facility and assist them in seeking jobs outside the company, he said. IT exporter Mahindra Satyam has been exempted from providing financial statements in bids for government projects enabling the company to participate in tenders called by government units, which have one of the highest IT spends in the domestic market. A majority of these tenders require the financial statements of the bidder to be provided as prerequisite. Mahindra Satyam’s financials are in the process of being restated after its promoter and former chairman, Ramalinga Raju, confessed to falsifying the accounts in January this year. After the scam-hit company was taken over by Tech Mahindra, the board under the chairmanship of Kiran Karnik had sought an exemption from providing its financials, so it could be eligible to bid for government projects. Satyam has so far lost out on a Railways contract estimated at Rs 100 crore, with the opportunity to more effectively participate in future contracts worth Rs 3,000 crore. It also lost out an enterprise resource planning implementation contract from BSNL for around Rs 250 crore to rival, HCL Infosystems. “This directive, along with the Mahindra & Mahindra balance sheet, will help us participate in tenders by government departments and PSUs. The directive says the audited financials should not be a point of contention and we (Satyam) should be considered based on our technical proficiency,” a highly placed Mahindra Satyam official told ET. However, the company is not likely to contest those bids that it has already lost out to rivals. “Earlier, we were not even being invited for bidding — now at least we will be able to participate in them. But there may be still some government contracts where we cannot participate if there are other criteria,” the official said. The firm is currently participating in around 15-20 bids from public sector undertakings and government departments, said Sanjay Venkatraman, who heads the India business unit at Mahindra Satyam. “These projects range from Rs 20 crore to Rs 100 crore and are in the areas of e-governance and citizen services,” Mr Venkataraman added. The exemption from the ministry of corporate affairs is valid only till December this year and since the restatement of accounts are expected to take up to March, Mahindra Satyam is likely to apply for the exemption to be extended till that date. The company has created a separate division under its India business unit to focus on government projects. Mahindra Satyam lost a Railways contract estimated at Rs 100 crore, with the opportunity to more effectively participate in future contracts worth Rs 3,000 cr. It also lost out an enterprise resource planning implementation contract from BSNL for around Rs 250 crore to HCL Infosystems. Mahindra Satyam is currently participating in around 15-20 bids from public sector undertakings and government departments. While 30% of the new hires would be freshers, the remaining 70% will comprise experienced professionals. This will take the company’s total workforce to more than 57,000 globally. The software major struck various IT outsourcing services deal in the past few months, which has led to an increase in demand for workforce. Till last year, the company was high on campus hiring and took 15,000 freshers and professionals on rolls. However, the firm intends to go slow on campus hiring this year owing to overall slowdown in demand for IT services world-wide. He said the company has no plans to alter the compensation package of the freshers and that variable component of the salary will solely be performance based. Early this year, the company had put a freeze on employee salaries and resorted to bonus cutbacks, citing tight demand and declining volumes in the US and Europe as the rationale. HCL has added a couple of new clients in the past few months. The firm bagged two IT outsourcing services contracts worth $110 million from Texas-based energy companies, Energy Future Holdings and Oncor. To support the growing business, the company will also scale up headcount in Texas over the next few months. The company currently serves clients in sectors, such as aerospace, defence, financial services, government, retail, lifesciences and telecom. The US-based conglomerate General Electric (GE) has extended its multi-million dollar contract with Mahindra Satyam for three years starting January 1, 2010, giving a boost to the IT firm, which has started winning new outsourcing deals. Mahindra Satyam, which also counts Citigroup, GlaxoSmithKline (GSK), Cisco Systems and Nissan, among its clients, is one of the top three vendors for GE. Its contract with GE has been for over a decade now in specialised areas of development, maintenance, business intelligence and engineering services. Around 1,500 employees will work on the GE deal. “GE recognises the support extended over the years by Mahindra Satyam, and their commitment to delivery excellence, even during trying times,” said Steve Morrison, GDC leader of GE. GE has signed a similar contract with 11 other vendors. “The extension is a testimony to the commitment our associates have demonstrated and truly symbolises the value we have been able to add through our services,” said Arvind Malhotra, global account executive of Mahindra Satyam. Harit Shah, IT analyst Angel Broking, sees GE’s decision to extend the contract as a vote of confidence on the new management at Mahindra Satyam. Two months ago, global pharma major GSK extended its contract with Mahindra Satyam for five years to provide SAP and other critical systems support. Satyam had been working with GSK since 2002 in providing IT services. The US-based OC Tanner — a human resource consulting and services company — followed suit. Last week, the firm renewed its contract with Mahindra Satyam to providing application development services to the US-based company. Over the past four months, Mahindra Satyam, earlier known as Satyam Computers, is reported to have gained over 32 new customers, including some large clients. It has around 430 clients now. Satyam was acquired by Pune-based IT services firm Tech Mahindra in April, after the firm’s defamed founder B Ramalinga Raju confessed to perpetrating India’s biggest corporate fraud. Customer confidence took a knock after Raju’s confession. The company is now attempting to regain contracts to turnaround, even as its accounts are in the process of being re-stated. Shares of Mahindra Satyam fell 1.7% to close at Rs 116.70 on the Bombay Stock Exchange on Thursday. Mahindra Satyam is lifting the freeze on promotions, even though they will be on a selective basis. This follows similar moves made by IT majors Cognizant, Wipro and Infosys and is indicative of an improved environment, say analysts. Mukund Menon, head of business HR worldwide, Mahindra Satyam, told Financial Chronicle that while no pay hikes are planned this year, there will be promotions for star performers. The Hyderabad-based firm has also decided to reinstate the variable portion of salary and other benefits for associates across all levels, effective from October 2009. Cognizant and Wipro were among the first to give promotions to selected personnel in FY10. According to industry trackers, multinational firms such as Accenture and IBM have also given promotions and hikes to top performers. Infosys and TCS are also comtemplating promotions and hikes this year. These firms had earlier said that they will not give any promotions and salary hikes in FY10 considering the present market environment. Company officials suggest that the initiative by these firms is due to the improving business scenario. Some HR analysts, however, say that it’s not just a better demand scenario that is driving companies to give promotions and hikes. Kris Lakshmikanth, CEO of Head Hunters India, says that selective increments have primarily been at the project manager and above levels even while several companies have decreased their salary package offerings at fresher levels. Seems Indian techies have been luckier than their counterparts in the US. According to a study by TechAmerica Foundation, US technology industry cut 115,000 jobs in the first half of 2009, compared to the 72,900 tech jobs added in the same period in 2008. However, in the US too, the tech sector seems better than other industry verticals. While between June 2008 to June 2009, tech lost 224,100 jobs, a 3.7% decline; the US private sector shed jobs at a higher pace of 5.1%. The Washington-based non-profit foundation also said that high-tech manufacturing in the US continues to shed jobs, having lost 69,500 from January to June 2009. The high-tech services sectors shed 45,500 jobs from January to June 2009, a 1% drop. The report also said that for the first time in its 5-year history, all three services sectors saw losses: engineering and tech services lost 21,500 jobs, while communications services shed 13,600 jobs. In software services the job cuts stood at 10,400. Dell India will look to retain almost all of Perot System’s employees and will not be in a hurry to sink the Perot Systems brand, thou gh the personal computer giant has entered into an agreement to acquire the latter, after searching for a services firm for years. An official with Dell India told Financial Chronicle on condition of anonymity that Perot would remain a separate brand until such time that the acquisition was complete and the results start showing. Then it will be known as Dell’s services unit. It is not immediately clear as to how long that process will take, but indications are that it could be completed by January next year. Officially, Dell India is not willing to share more details. “It’s too early for us to comment on what it means for the company in India,” said Dell India’s head of corporate communications, Minari Shah. The official whom FC spoke to in Dell India said the company is on the lookout for more acquisitions in the services space. “A few of the Indian IT firms are on the radar,” the person said. “Other big players namely IBM and HP had moved into other higher margin businesses such as services and software. There was pressure on Dell to get out of this pure hardware giant portfolio. As you know, the margins in the hardware business was getting tough to maintain,” the person added. Dell has close to 12,000 people in India, spread across four segments, research & development, marketing, domestic sales and business process outsourcing. The company’s BPO centres are in four cities—Chandigarh, Hyderabad, Bangalore and Gurgaon. Perot Systems has over 8,000 employees across six centres in India. The Bangalore, Noida and Pune centres cater to the application development and infrastructure services. Hyderabad, with around 80-100 people, offers engineering services. The company’s BPO operations are run from Chennai and Coimbatore and consists of over 4,000 people. But it is not clear whether everyone of them would be retained when the integration gets completed. “It’s too early for us to say anything on that front,” said Minari Shah. However, insiders felt that all Perots Systems employees will be retained. Rajiv Mehta, senior IT analyst with India Infoline, told FC that it remains to be seen what kind of advantage Dell will enjoy in India with this acquisition. “Perot is a small firm. It employs only 8,000 people and that’s not a large scale operation,” he said. Dell’s vice-president (product marketing) Sally Stevens told Financial Chronicle that Dell is fashioning itself into a solutions provider from an end-to-end standpoint. “We have been able to help our customers save a lot of money during the downturn with our product offerings,” she said. Dell’s global commercial customer base spans large corporations, government agencies, healthcare pro viders, educational institutions and small and medium enterprises. Infosys Technologies has told its over one lakh employees that they can expect pay hikes and promotions by October, joining India’s top tech companies in lifting wage freezes and signalling rising optimism for the software industry’s growth prospects. India’s second-largest software exporter has kicked off a performance appraisal process right in the middle of the festival season, saying in an email last week to staff that hikes and promotions will be effective next month. “Yes, we are giving hikes this October. It will happen across the board,” Infosys group HR head Nandita Gurjar told ET NOW over phone from Poland on Tuesday. She did not say what the extent of the salary increase would be. India’s largest Software company TCS, third-ranked Wipro, as well as Cognizant and HCL, have already announced a return to salary hikes and their ranks have been joined by smaller rivals such as MphasiS-EDS, Sonata Software and Symphony Services. Som Mittal, president of software industry grouping Nasscom, said IT services providers have been winning large deals in recent months and investments in new markets are beginning to pay off, driving the revival.“The downturn has been severe but the industry has worked to see that the impact is minimal. They have done well in the first quarter. This is a people-led industry, so lot of companies are selectively rewarding employees who have worked hard,” he observed. Infosys’ Ms Gurjar said the company decided to skip the promotion cycle in April this year as employee utilisation and billing rates were low. But a sharp rise in utilisation rates since made it decide to reward staff. While improved demand and natural attrition have pushed up the utilisation rate at Infosys, operating margins are also seen well ahead of its target of 30%. Infosys’ wage bill is estimated at 45-46% of sales, and the company has projected that FY10 revenue will grow by 3.1-4.6% to $4.45-4.52 billion. Nasscom has projected that the $60-billion IT services industry, which employs about 2.5 million, will grow by just 4-7% this fiscal, hit hard by a recession in its main market, the US. “The downturn is bottoming out, and we will do a review of the growth target in December. But this 4-7% target also factors in selective promotions and hikes,” Mr Mittal said. In a normal year, employees in tech firms get pay hikes of 5-15%, but this time companies such as Wipro are being selective about who gets rewarded and restricting pay-raises to only the best performers. MphasiS and Sonata Software, on the other hand, are linking pay hikes to the companies’ performance. Two of India's IT bellweather companies Tata Consultancy Services and Wipro bagged contracts from major agencies. Wipro Ltd, India's No. 3 outsourcing company, said on Wednesday it had won a three-year IT services contract from Aquarion Water Company, one of the largest water utilities in the United States. Tata Consultancy Services (TCS) on the other hand has won India's largest state-wide area network (SWAN) project from the Andhra Pradesh government. Financial details of the Wipro deal were not disclosed. TCS' five-year project is based on a build, own, operate and transfer (BOOT) model. "This is the fourth SWAN project TCS has bagged in a row," said a company statement here Wednesday. It is now implementing SWAN projects in Chhattisgarh, Tamil Nadu, and Bihar. The proposed SWAN project will enable the state government to start and run various e-governance projects and citizen services. The project would be rolled out in 12 months and TCS will then maintain it for five years. "We are happy to partner with TCS for this project. This is yet another initiative of the state government to take a wide array of services to the common man," said Sameer Sharma, secretary and chairman of Andhra Pradesh Technology Services. The project envisages connecting state headquarters with 1,088 sub-divisions and 23 district headquarters. Once the project is commissioned, the network will enable the state to have video-conferencing facility across government offices and enable them to communicate and conference with each other over VoIP (voice over IP) phones, which will reduce the government's phone bills considerably. Various e-governance applications like RTO, healthcare, education, municipality would also ride on this network backbone, said Sanjay Kumar, managing director of Andhra Pradesh Technology Services. Wipro Ltd, India's No. 3 outsourcing company, said on Wednesday it had won a three-year IT services contract from Aquarion Water Company, one of the largest water utilities in the United States. Financial details of the deal were not disclosed. Tata Consultancy Services on Wednesday said it has been awarded a state-wide area network (SWAN) project from the Andhra Pradesh government, which targets to connect the state’s headquarters with all 23 district offices in the state to increase efficiency in government functioning. Andhra Pradesh IT secretary Sameer Sharma said the size of the deal would be about Rs 140 crore. This is the largest such contract in the country and will be based on the build-own-operate-transfer (BOOT) model, that is typically used in infrastructure projects for five years, TCS said in a statement. Oracle Corp Chief Executive Larry Ellison said Sun Microsystems Inc is losing about $100 million a month as European regulators delay approving his company's $7 billion purchase of the struggling hardware maker. Tata Consultancy Services (TCS) is looking at Rs 3,000-crore government projects to help it double its revenues from the domestic market in three years. The country’s largest IT services company is chasing 24 projects related to technology implementation in railways, defence, power and several state governments. The company hopes to bag a large number of these projects in the coming 12-18 months and double the share of its domestic business to 10% in three years. “We expect to increase domestic revenues to double digits by 2012,” said Tanmoy Chakrabarty, vice-president and head of global government industry group at TCS. The increased activity in the domestic market - particularly from underpenetrated government departments and ministries - will help the portfolio of the export-focused domestic IT services firms as the global slowdown has seen their growth tapering off. “Prior to elections, decisions were on hold. But now with the new government settling down, we expect quite a few large projects to be announced in the domestic market in 12-18 months,” said George Paul, executive vice-president for marketing at HCL Infosystems. HCL is also pursuing technology projects related to power, telecom and computerisation of municipal corporations in several states. Infosys Technologies, the country’s second-largest IT services company, is similarly pursuing opportunities in the domestic market. The Bangalore-based company’s nascent India business unit has bid for defence, telecom, railways and some power projects. The company was unavailable for comments as it is observing a mandatory silent period before announcing its financial results for the second quarter. In a recent interaction with ET, Infosys’ India business unit head Binod HR had said, “Given that the government is technically underpenetrated, there are a large opportunities to tap. We will be pursuing them.” The company had recently bagged a 10-year e-business project from the ministry of commerce. Small to mid-sized companies such as Mumbai-based Spanco that has bagged projects in Maharashtra and Orissa see opportunity in the domestic market. “We are chasing businesses like modernising public distribution system, border check posts and developing e-districts,” said Kaustubh Dhavse, head of business strategy at Spanco. As government departments increasingly take the hi-tech path, there will be plenty of business for locally-focused IT players. Wipro plans to explore options to sell its development centre at Sophia Antipolis, France, because of extensive employee protests against shutting it down. The issue had snowballed into a major controversy with the involvement of the local French government officials. Wipro had initiated talks to close down the centre that it acquired from Newlogic because of poor demand. The centre employs around 60 people. “As part of the ongoing process, we will continue to look favourably on any proposal that we may get from interested parties willing to continue part of totality of the activities in the Sophia Antipolis centre,” Pramod Idiculla, general manager (strategy), Wipro Technologies, told ET. The Indian IT firm acquired privately-held Newlogic in 2005 for around $56 million. A cross-section of consultants ET spoke to said Wipro may find it hard to sell the facility in this environment. “I am not sure, if the Newlogic unit will find any buyers. A safer bet would be to wait for the demand to improve and then take a call,” said a semiconductor design consultant based in Germany. “These 60-odd engineers may be few in numbers, but any move to sack them will create a public unrest in this region, there’s already pressure on EU countries to ensure that jobs do not go outside the region,” he added. Wipro Technologies leads the Indian IT research & development (R&D) services revenue chart with a revenue of $800 million, a management survey said on Wednesday. TCS, with revenues of around $700 million, closely follows Wipro, with HCL next in line with $523 million. Infosys, according to the survey, is way down with revenues of under $100 million from R&D services. Zinnov Management Consulting, which carried out the survey, said mid-market companies such as Aricent, MindTree, Symphony Services, Global Logic and Sonata Software, which generate over $150 million from R&D services, will soon rise to the forefront. The total R&D services market in India is worth $3.5 billion. Wipro Technologies joint CEO Girish Paranjpe told Financial Chronicle that R&D is in the company’s DNA. “We were the early birds in offering R&D services outsourcing. As a company, we pride ourselves in being the best in this space,” he said. Paranjpe said the R&D wave started with hi-technology, moving on to telecom, and now it is flowing into aerospace and healthcare. “I am hoping that Wipro will be able to raise over $1 billion from the R&D space in a couple of years,” he added. He said a company such as Infosys has traditionally lagged in the R&D services space. “That’s not surprising. They have not been focusing on it,” said Ananth. The survey said the impact of recession on R&D service providers has been felt across four key levers —contract re-negotiation, increase in sales cycle, bankruptcy of clients and fears of business continuity risk. Infosys Technologies was named for 2008 'Partner in Progress' award from Sears Holdings Corporation. In a press release here today the company said Infosys received the award for superior Information Technology services and outstanding client support. The award is presented annually to a select group of supplier companies that provide quality products and services, apparel, appliances and tools to marketing, facilities design and technology. Less than one per cent of 'Sears Holdings' over 30,000 suppliers get coveted award each year. Sandeep Dadlani, Vice President and Head of client services for retail, consumer packaged goods and logistics, Infosys, said ''We are honoured that Sears had chosen us as a winner of the coveted award for the third year in a row. We are privileged to be part of Sears commitment to improving its own customers' experience''. The Partners in Progress programme recognises suppliers for product or service quality, innovation, diversity and overall market performance. The winners were selected from nominations submitted by Sears Associates, who purchased goods and services for the company in 2008. Wipro Technologies, the global IT services business of Wipro Limited, announced the expansion of its facility in Reading and opening of a new office in London. The center at Reading was inaugurated by The Right Worshipful the Mayor of Reading. This center is an extension of the existing development center facility. This facility will be used for building centers of excellence, delivering customer projects and training purposes. Continuing its business expansion in the UK, Wipro is also inaugurating its new office premises in London. This office would be the headquarters for Wipro’s UK operations. The facility will serve as a sales office with state-of the art infrastructure. Revenues from Wipro’s European operations account for approx 26% of the IT major’s overall IT Services revenue. UK is one of the key markets for Wipro with a large customer base. The establishment of the new offices will now facilitate Wipro’s growth strategy in the UK and the overall growth in the European region. Indian IT firms are experiencing more demand for building high-value applications from customers for upgrading or maintaining their business software, reports the Livemint. Enterprise resource planning (ERP) is a high-margin segment that includes consulting as a key component and commands at least 40 percent higher billing rates than development and maintenance services. This software is typically sold and maintained by firms like SAP AG and Oracle. Indian firms began acquiring ERP capabilities in the recent years to enter the league of companies such as International Business Machines (IBM) and Accenture. For example, Infosys Technologies and HCL, India's second and fifth largest software firms, fought a bid last year to buy British ERP implementation and consulting firm Axon Group. This impulse came during the slowdown, when firms in the U.S. and Europe, the biggest markets for Indian IT firms, reduced technology budgets and spent minimum on the projects for maintaining existing IT infrastructure to keep their businesses running. With the market showing signs of revival, firms such as British oil explorer BP and power equipment maker ABB Group have started to upgrade their business applications but prefer outsourcing the work to firms in low-cost countries such as India. "Clients are becoming more open to discretionary IT spending, especially in areas such as enterprise resource planning, in which deep spending cuts have already happened," said Harmendra Gandhi and Pinku Pappan, Analysts, Nomura Financial Advisory and Securities. By discretionary spending, the analysts are referring to the money that customers keep aside to spend over their planned IT budget. "Customers are also talking about some transformation of deals, apart from offshoring support and maintenance work. Thus, the propensity to spend out of the 2009 Budget is much more now compared with that a quarter ago," said Gandhi and Pappan. The shift to Indian firms was also motivated by price increases at their regular vendors. Germany's SAP raised its annual support costs to 22 percent last year of the license fee from 17 percent earlier, describing this would bring down the total cost of ownership of the license for the customers. "Firms had not factored in a hike in maintenance fee during the recession and are exploring outsourcing to Indian vendors, who can maintain at half the cost, but with the risk of losing support on upgrades from the vendor," said Asheesh Raina, Principal Research Analyst, Gartner. Firms such as Wipro, HCL, Cognizant and even smaller companies such as Defiance Technologies, the IT services unit of the Hinduja Group, say customers want to improve efficiency and integrate their business software with their core processes, not just to cut costs. It does helps that Indian ERP firms are cheaper by at least a third than Accenture or IBM. "Saving costs and capital continues to be the most important thing clients are discussing," said Sangita Singh, Head, Enterprise Application Services (EAS), Wipro. The company had one third of 26 customers added in Q1 belonging to the segment. "You don't have many companies spending $100-200 million on new licenses. It may be in the range of $50-70 million. The implementation business is three to four times on licenses," said Singh. HCL earns nearly a quarter of its overall revenue from business software projects. EAS projects accounted for 23.6 percent of its fourth quarter revenue of Rs.2,908 crore, up from 10.8 percent a year ago. Five states posted jobless rates above 12% in August, according to federal data released Friday. California, Nevada and Rhode Island each hit record-high rates, the Labor Department said. Michigan led the nation in unemployment, with a rate of 15.2%, while Nevada was next at 13.2% and Rhode Island was third at 12.8%. California and Oregon were tied for the fourth spot, each with unemployment at 12.2%. "The losses tend to be heavy in states that have a high concentration of manufacturing jobs or were hit hard by the housing bust," said Mark Vitner, economist at Wachovia. In August, 27 states and the District of Columbia recorded month-over-month unemployment rate increases, while 16 states posted a decrease in unemployment and seven saw rates hold steady. The total number of nonfarm jobs fell in 42 states and the District of Columbia, while 8 states saw an increase. The state-by-state unemployment report for August came after the government reported earlier this month that American employers cut 216,000 jobs in August, sending the nationwide unemployment rate to 9.7% from 9.4% in July. Hexaware Technologies has recalled 90 per cent of its benched employees for active work as it gears up for a revival in the information technology (IT) space. The move follows a ramp-up in business from the company’s existing customers. “Over the past couple of months, we have seen renewed interest from our present customers in various sectors. Hence, we decided to get our people off the bench,” said Moorthi Chokkanathan, executive vice-president & global head - enterprise solutions. Hexaware, a mid-cap IT and business process outsourcing services and consulting firm, had announced the formation of a ‘virtual bench’ of 350 employees in March this year, to control costs and raise utilisation rates. The remaining 10 per cent of employees, who are still on the bench, are being put through what Chok kanathan calls a ‘cross-tra in ing programme’. Through the programme, the company is working on enhancing the skill sets of the employees in order to make them fit for various job needs. “Moreover, we are hiring at an average of 50 to 60 new people every month to keep up with our manpower requirements,” Chokkana than claimed. The company said it is also inducting 115 fresh employees, which it has recruited from various college campuses. Hexaware, which has a strong presence in the enterprise resource planning (ERP) segment, is planning to unveil its ERP shared services support, a new 24x7 service offering, this week. The new service would help its clients bring down their IT management costs by 20-30 per cent, the company claims. “Over the past year or so, we have realised that several companies are looking for more while wanting to pay less, due to the depressed market conditions. This ser vice is a response to those clients’ needs,” Chokkanathan said. The average IT sector attrition rate, which was 18 per cent last year has dropped to 15 per cent, according to a survey by IDC, a premier global provider of market intelligence, advisory services, and Dataquest. Despite the marginal increase in salaries, a freeze on fresh induction, layoffs, cutting down on talent and keeping offer letters on hold, the industry saw a dip in attrition rate to 15 per cent. The average retention rate, defined as percentage of employees retained out of the total employees as on March 31, 2008, improved to 85 per cent, from 79 per cent in 2008, the survey stated. The survey results indicate a visible improvement in work environment even though the average salary increases during the year were pared to 1.4 per cent. The salary increases for employees with less than two years of experience earned 2 per cent increase. Those between 5.1 and 10 years received an average salary hike of 5 per cent and those with over 10 year experience earned four per cent salary increase. A majority of IT employees said they changed jobs for better salaries and compensation (53 per cent), overseas postings (38 per cent), better job security (18 per cent), flexible working hours (18 per cent) and training and development (9 per cent). The survey also reveals that companies have become more transparent in their communication with employees giving them a sense of belonging. They have also gone ahead and adopted a higher degree of professionalism in their dealings with employees as well as customers or suppliers. Dell Inc said Monday it has agreed to buy the information technology services company Perot Systems Corp for about $3.9 billion as it looks to expand beyond the personal computer business. Round Rock, Texas-based Dell said it will offer $30 per share in cash for Perot, which is based in Plano, Texas. This represents a 68 percent premium over Perot's closing share price Friday, and Perot shares shot up 66 percent in premarket trading Monday. Adding options and restricted stock to Perot's 121 million outstanding common shares, Dell said the deal is worth $3.9 billion. Dell said Perot, founded by former presidential candidate Ross Perot, will expand the company's IT services offerings for businesses and widen the pool of potential customers for its computers. It expects to close the deal in the November-January quarter. Analysts have been expecting an acquisition from Dell, which hired IBM Corp's former mergers and acquisitions chief earlier this year and has raised almost $1 billion in debt since March. The company's shares fell 79 cents, or 4.7 percent, to $15.90 in premarket trading, while Perot's stock shot up $11.79, or 66 percent, to $29.70. India's financial technology firm Polaris Software Lab is planning to expand its footprint in the European markets beyond continental Europe and Sweden could be the base to cater to the large untapped region. "We are interested in expanding our European market base and we see Sweden as a potential hub to cater to the northern, central and eastern Europe," Polaris EMEA Chief Operating Officer Chander Singh said. Polaris is considering joint venture alliances with local service providers, system integrators and others to be able to serve large customers in Sweden and other Baltic and Nordic countries. "In the next three years, revenue from Sweden and nearby Baltic countries and other Nordic nations should increase four-fold to be in the range of USD 10 million to USD 15 million," Singh said. The company, which earned USD 300 million revenue last fiscal, gets 85 per cent of its revenue from the banking, financial services and insurance (BFSI) vertical. Polaris earns one-third of its revenue from the Europe- Middle-East-Africa (EMEA) region and expects to add up to 20 per cent of its revenue from Europe through the expansion planned. India and China by virtue of their large pool of skilled IT employees enjoy a significant advantage among emerging markets but lack of IT infrastructure remains a dampener, blunting their competitive edge, a report by Economic Intelligence research said. Economic Intelligence Unit (EIU) is the research arm of London-based publication, Economist. The report, 'Resilience amid Turmoil: Benchmarking IT Industry Competitiveness 2009', ranks India at the 44th position in the IT Industry Competitive Index 2009, four positions higher than its 2008 ranking. Overall, 66 countries feature in the index. "In emerging markets, large pools of IT skilled employees remain a significant advantage for China, India Russia and other countries, but uneven progress in other areas such as IT infrastructure, remains a drag on their IT competitiveness," the report said. However, despite accusations against the Obama regime of being 'protectionist', the US retains the top ranking, followed by Finland, Sweden, Canada, the Netherlands and the Broadband networks are becoming increasingly essential to IT firms' competitiveness, the report said, adding the slow march of the technology (broadband) in emerging markets including those with large IT sectors such as India, Russia and Brazil , could impede their IT firms' growth. Forecasting a fierce competition to acquire best talent once the recession blues fade away, the EIU research calls for coordinated efforts among governments, universities and IT firms to improve the quality of technology, training and expand the pools of potential hires in Asia. Investment in skills development remains a long-term imperative, the report said, adding, "In Asia, IT training would benefit from greater investment in business studies and language skills," it said. "The Intellectual Property (IP) regimes are improving in many emerging markets but more progress is needed. As innovation becomes more important than low-cost labour to IT firms in China and India, IP enforcement is expected to improve in these countries as well," the report observed. Infosys Technologies, Wipro and HCL Technologies are among the software service providers that are laying foundation for the next round of multi-million dollar orders from the big US corporations, by pitching for low-value, but politically important US state governments’ orders. Infosys, which counts JP Morgan and Morgan Stanley as clients for its services, bids for Arizona Public Service’s (APS) 400 positions, who work in its information-services department, and another 400 or so contractors to raise the staff strength for undisclosed amount. Nine other US states, some from where politicians opposed offshoring work, are looking to outsource their healthcare operations worth over $2 billion, said Wipro chief strategy officer KR Lakshminarayana, and the company hopes to get a slice of these. “The discussions are not about offshore outsourcing, but more about working with newer outsourcing vendors, who can deliver locally and keep the jobs here at lower rates,” said a senior executive at one of the Bangalore-based tech firms exploring this opportunity. Many US states such as Missouri, Virginia and Arizona, which are battling falling revenues amid the worst economic slump in their country since the 1930s, are attempting to reduce costs and at the same time want to increase employment opportunities for their citizens. So, they are including clauses such as recruitment of minimum number of staff from their states. Indian companies, which were used to contracts of hundreds of million-dollars at one go, are bidding for these low-value orders since their traditional clients are cutting down on technology spending and at the same time provides visibility, which would be helpful in getting big orders when tech spending recovers. “The marketing muscle that comes from such contracts is huge and working with the US state governments send out a signal of importance to other customers,” said Siddharth Pai, managing director of outsourcing advisory firm TPI’s India unit. “For the Indian IT companies this is not a core business, but it creates a halo effect,” he added. While the global government IT outsourcing market is estimated to be around $100 billion, experts tracking the sector said the US state governments could outsource projects worth up to $5-6 billion this year. States, which in the past opposed the outsourcing of work to Indian companies by the likes of Microsoft and Citigroup, are now turning to the same Indian companies, as their mission now is in line with that of the companies cut costs. Rodney Nelsestuen of US-based research firm TowerGroup, said state governments in the US are suffering from a reduction in tax revenue due to high unemployment and lower spending on taxable items by the US consumers. “Significant budget cuts are making it difficult for states to maintain the level of services that residents expect. Outsourcing has become an option that governments are looking at,” he added. The orders from these state governments are for maintenance of records, accounts, healthcare and other administrative jobs, said a consulting firm engaged with a few governments. Indian companies are not worried about the fact that they may be at a disadvantage to their US peers such as IBM and Hewlett-Packard, which are more familiar with the functioning of the local governments. “As long as you have the competency and ability to deliver what they want and from where they want, you are as competitive as your local peer,” said Wipro’s Mr Lakshminarayana. Wipro already has a $407-million deal from the state of Missouri for application, maintenance and development (AMD) and BPO work for the state’s healthcare division, which it bagged in December 2007. “They always ask us how many local jobs will we create and that sometimes is an important factor,” he added. TCS, Wipro, Infosys and Cognizant are among a few vendors, who have already hired local citizens. TCS has hired 120 people for its centre in Cincinnati. “The level of success that India-based outsourcers will have in the future rests on their ability to add local talent, their ability to be viewed as global service companies and not just India-centric, and how quickly they assimilate government requirements – something India-based companies should be good at given their outsourcing history on a global and multi-industry scale,” said Mr Nelsestuen. Mobile services provider Vodafone Hutchison has announced offshoring a total of 450 call centre jobs from Melbourne to India and Tasmania. The decision comes three months after Vodafone Australia Ltd and Hutchison 3G Australia formed a 50:50 joint venture. A spokesman for Vodafone Hutchison Australia, who earlier flagged a total of 380 job cuts, said the company would transfer an unspecified number of positions to a call centre in Mumbai and about 100 jobs to Kingston, Tasmania. Service Stream, the company that was running Vodafone contract confirmed the telecom operator's plans to end the contract employing 450 in customer service and support roles starting in October to February, in a move that will shift the positions to Vodafone offices in India and Tasmania. Service Stream acting managing director Michael Doery said the company would try to find new roles for the affected employees, but was unlikely to accommodate them. "We're trying to do the right thing for our staff but not give them false expectations," he was quoted as saying in 'The Age'. After software giant Wipro lifted freeze on promotions and hikes, although selectively, mid-sized technology firms like MphasiS-EDS, Sonata Software and Symphony Services are also planning to increase salaries and give bonus. IT services firm MphasiS, which recently bagged new outsourcing contracts, has announced a recompense bonus for its staff which the company feels is possibly an innovative compensation model. “For good performers, the bonus can be 15-25% higher than the average pay hike,” MphasiS chief human resources officer Elango R said. Recompense bonus will compensate for the salary freeze which was introduced in early 2009. “It is a one-time adjustment in the form of a bonus to reward employees for their commitment and contribution,” said Mr Elango. The recompense bonus is guaranteed up to the third quarter and is linked to the company’s overall performance and that of the business units as well as to the performance of employees, which includes the individual appraisal rating, for the fiscal year ending 2009. Offshore product firm Symphony Services is planning to hike salaries for all its employees by 7-8% once its budget is ready. “We are noticing that other companies are also contemplating hikes of 5-8%. However, companies are keeping a watch on the overall market,” C Mahalingam, executive vice-president and chief people officer of Symphony Services, said. Like MphasiS, Sonata Software, too, has introduced a new package called ‘company-linked performance pay’. Last year, the firm had dropped annual incentives and appraisals due to the economic meltdown. “But this year, there will be appraisals, salary increments between 7-10% and incentives based on performance because the market is getting better and Sonata is getting projects from the UAE, the US and the UK,” said a person privy to the developments. These changes come at a time when layoffs and salary cuts have become a rather controversial method to control cost. Experts like Ashok Reddy, managing partner and co-founder of staffing company, Teamlease, said business is picking up and companies are increasing salaries based on employee performance, revenue and profit rise. “Many companies are restructuring pay scales or cost-to-company compensations. And attrition rate will also grow as more jobs are coming in,” said Mr Reddy. Going forward, mid-sized companies will explore more innovative compensation models that will be based more on performance, experts said. To boot, apart from the bonus plan, MphasiS has announced a quarterly performance-linked pay model for FY10. “Effective November, a percentage of annual fixed and base salary will be converted to variable which will be paid based on quarterly performance of the company and the business unit,” Mr Elango said. Indian IT services firm Mahindra Satyam has gained 32 new customers in the last four months, and some large clients are returning to the company, a top official said. "Some of the large clients we had lost earlier are coming back and are reassigning new business," Atul Kunwar, the company's president of the Middle East, Europe, India and Asia Pacific regions, said on the sidelines of an industry conference. The company, earlier know as Satyam Computer Services, currently has about 420 clients, he said, compared with 480 in January before it was left battling for survival after Satyam's founder revealed India's biggest corporate fraud. Satyam was acquired by Tech Mahindra in an auction in April and subsequently renamed. The number of employees the company has on reserve has come down to 7,000 from 8,500 in July, Kunwar said. "With the business improving and new deals coming in, we have slowly started taking in employees from the virtual pool." Expanding its footprint in Latin America, the country's largest software exporter TCS today said it has opened a new delivery centre in Buenos Aires for providing consulting, BPO and IT services which will employ 250 professionals. "Our growing presence in Latin America continues to be of strategic importance to our overall business growth and we remain committed to working in close collaboration with institutions and universities (here) to help foster the development of local talent in Argentina and provide our customers with IT solutions from this location," TCS CEO S Ramadorai said. The new centre would provide consulting, advanced IT solutions, BPO services and IT product implementations besides, housing the company's first regional SAP centre, the company said in a statement. This is the eighth global delivery centre of TCS in Latin America, in addition to centers in Brazil, Argentina, Uruguay and Mexico. Indian IT companies have been focusing on South America and countries such as Argentina and Brazil as a destination for offering services to clients in the US time zone. Shares of TCS were trading at Rs 568.50, down 0.42 per cent in afternoon trade at the Bombay Stock Exchange. Infosys Technologies Ltd, India's second-ranked software exporter, said the business environment is challenging and clients are cautious in spending, although pressure for price cuts has eased. The company, which employs more than 100,000 people, is not seeing any reason to accelerate hiring at this point of time due to the uncertain business environment, Chief Operating Officer Shibulal said.
" We are very honestly over-hired ," he said. "There is a very slight blip of activity, but there is nothing to tell me it (a recovery) is secular in nature." Hopes of a pick-up in demand for outsourcing, which had been hit by the global downturn, increased after major Indian IT firms including Infosys beat street estimates in their April-June earnings and announced some large deals in the recent months. But Infosys officials said that decision making by clients continued to be slow. "The situation is still quite challenging," S D Shibulal said. "If you look at our customers, they are not really seeing any increase on their revenue side. And because they are not seeing any increase on their revenue side, they will continue to be concerned." The head of Nasscom, India's leading IT industry lobby, said signs of recovery in the United States were yet to translate into real business growth for outsourcing firms, though a pick-up was expected in the second half of the year. Infosys Chief Executive S Gopalakrishnan said he expected technology spending by the company's clients to be flat in 2010 from the previous year. Ahead of the news, shares in the company valued at about $27 billion, closed up 0.9 per cent, underperforming a 1.5 per cent rise in the benchmark index. The company's shares have doubled so far in 2009, outperforming a 70 per cent rise in the broader market. Infosys has forecast its first annual revenue fall for the year to March 2010 on demand for fee cuts by its overseas clients. Most negotiations with clients on price cuts was over and the company was not seeing a second round of such talks, Shibulal said, but large deal flows were yet to resume. "Overall, deals above $500 million which used to be there before the downturn, they have not reappeared in significant manner," he said. Infosys and local rivals Tata Consultancy Services and Wipro last month won IT services contracts from oil and gas major BP Plc. Shibulal said Infosys' share of the contract was worth $116 million over five years. Chinese investors should employ more Indians to run their projects in India instead of bringing large number of workers from China. This is New Delhi's latest response to complaints concerning India's reluctance to grant enough visas for Chinese workers. An India-specific approach will have to be thought over by Chinese companies, S Jaishankar, India's new ambassador in Beijing told a conference attended by Indian and Chinese businessmen and officials. He pointed out that companies from other foreign countries did not feel the need to bring their own workers to projects in India, which has a vast reservoir of skilled workmen and a long history of industry and entrepreneurship. "I have personal experience in working with many of India's other major economic partners. I cannot recall their investments and projects requiring such large manpower support from home," Jaishankar, who was earlier ambassador in Singapore, said. The statement comes at a time when several Indian companies have joined the chorus along with their Chinese partners about increasing the issuance of visas for Chinese workers. But the Indian government is not encourahing this because large inflow of foreign labour can thwart skill development and cause heart-burning among Indian workers. It is possible that business models of non-Chinese investors are based more heavily on collaborating with local Indian capabilities, he said, while speaking at a seminar organized by Ficci and the China Council for Promotion of International Trade. Indian companies sourcing equipment and services from China should advise and assist the sellers on reducing their dependence on Chinese workers and using more of Indian skill, Jaishankar said. Companies from other foreign countries do not feel the need to bring own workers to projects in India, says ambassador Jaishankar His statement comes at a time when Indian comapnies have also joined the chorus with their Chinese partners for increasing the issuance of visas Indian govt is not encouraging this as large inflow of foreign labour can hit skill development and welfare of Indian workers. Adobe Systems plans to pay $1.8 billion for fast-growing business software maker Omniture as the maker of Photoshop and Acrobat looks to turn around declining sales. Adobe, which announced the deal on Tuesday as it reported lower quarterly sales and profit, has been struggling over the past year as the recession hurt technology spending and customers declined to upgrade older versions of its programmes. “There is no way Adobe can grow organically. This is a smart move,” said Global Equities Research analyst Trip Chowdhry. Verizon's Chief Financial Officer John Killian is not sugarcoating what's in store for the ILEC's workforce: more job cuts are coming. During an investor conference late last week, Killian said additional employee reductions are necessary, but would not offer a specific timeline when these cuts would occur. Over the past year, Verizon laid off 8,000 workers with plans to cut another 8,000 in the second half of 2009. The recent economic downturn, ongoing voice line loss and accelerated growth of its wireless and FiOS video services drove these job cuts, according to Killian. To extract more savings out of its wireline business, the company also will consolidate its call centers and integrate some services. "We've been steadily reducing our overall work force size," Killian said to analysts during an investor conference. "But, we realized that we need to do more and in an accelerated pace." 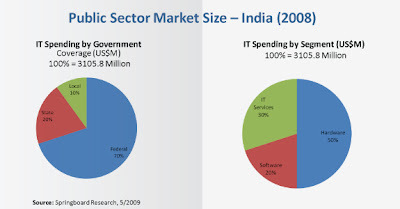 With the aim to modernize its services, IT spending by India's public sector reached an estimated $3.1 billion in 2008. The spending is further expected to grow to $5.1 billion by 2011, indicating a compounded annual growth rate (CAGR) of nearly 19 percent from 2007 to 2011, says a report by Springboard Research, an IT market research and advisory firm. According to the 'Public sector IT opportunity in India' report, more than two-thirds of the total IT spending will be undertaken by the central government, with state government and local governments contributing to the rest of the spending. The report provides a detailed coverage of the public sector market dynamics in India, including buying process, for the key segments like healthcare, education, defense and public safety. "The re-election of the Congress-led UPA government will spur further investments in e-governance projects, including the $5 billion National e-Governance Plan," said Nilotpal Chakravarti, Senior Research Analyst - Vertical Markets at Springboard. The report also notes that education is the biggest individual market segment in terms of spending with an 11 percent share of total spending; while defense and public safety and taxation and finance round up the list of top three segments. In terms of IT segments, hardware corners half of the overall spending, while IT services has a bigger share than software. According to the report, the current key challenges IT vendors are facing include slow decision-making process despite the adoption of e-procurement, delays caused by bureaucratic hassles and complex bidding procedures and a price-sensitive market. On the other hand, the end-users (citizens) face challenges in the lack of transparency and efficiency in government services, lack of integration among different government agencies and poor mechanisms of complaint handling. In its future market outlook, Springboard points out the high growth rate for healthcare and education. Other areas of future high growth include public transportation and utilities projects. Indian IT major Wipro Technologies has partnered with global energy management firm Schneider Electric to market its industrial automation solutions in India. Under the agreement, Wipro will offer an additional commercial channel and outstanding project execution capability Schneider to market and deliver its state-of-the-art solutions. To begin with, Wipro will market Schneider Electric's Ampla MES solution to the mining, mineral processing and metals industries. This solution helps manufacturers enhance the efficiency, productivity and reliability of their industrial operations and improve their return. "Our partnership with Wipro is an indicator of our commitment to the Indian market. It shows our willingness to go beyond conventional business models to grow our business here," Schneider executive vice-president Michel Crochon said. United Progressive Alliance (UPA) chairperson Sonia Gandhi inaugurated a world-class corporate education centre of Infosys Technologies at its Mysore campus. The facility is an extension of the IT major's Global Education Centre (GEC), which was inaugurated by Prime Minister Manmohan Singh in February 2005. With the GEC II, set up at an investment of Rs 800 crore, Infosys can now train 14,000 new recruits at the same time. Given its infrastructure and size of operations, GEC is the largest corporate education centre in the world, Infosys officials said. After the inauguration, Gandhi said the centre was a testimony that India can also build world-class education and training centres. "It's a pleasure to be on this beautiful campus. It has a marvellous setting for a university to train and educate young minds," she told a gathering, mostly young employees of the IT bellwether. "The GEC is the testimony that India can have world-class education centres. The success of Infosys is because of its hard work, dedication and talent." Karnataka Chief Minister B S Yeddyurappa, Infosys chief mentor N R Narayana Murthy, and chief executive S Gopalakrishnan were also present on the occasion. The building of the new facility shares architectural resemblance with that of India's parliament and Rome's Colosseum. The entire Infosys campus here is spread over 337 acres. Murthy told the audience that the main goal of Infosys was to fight poverty with the power of entrepreneurship and creating jobs. "The centre is a proof of the progress we have made so far. GEC is the largest monolith classical building of post independent India," added Murthy. Infosys, according to officials, invests an average of Rs 250,000 on training a potential employee over a period of 16 weeks. Wipro has won a three year outsourcing contract from All Nippon Airways (ANA), the first airline in the world to procure the Boeing 787 Dreamliner. The financial details of the deal have not been disclosed, but Wipro will deliver materials management system to ANA that will help manage the parts life cycle, reports Economic Times. The system will strengthen regulatory compliance, predict parts demand better and help manage inventory levels. The new Materials Management system will be built in a scalable, flexible platform. ANA, with its fleet of 209 aircraft, is embarking on transforming its legacy materials management system to support the new fleet, in line with the expansion of its business at Tokyo's Haneda Airport with its upcoming fourth runway in 2010. ANA will be able to increase its cost competitiveness, improve the quality of its aircraft part maintenance business and improve asset management with the new system. The complete program will be managed by Wipro, which will deliver services such as application development, program management and vendor management thereby enabling ANA to gain a sustainable competitive advantage. Takanori Yukishige, Senior Vice President, ANA Information Technology Services said, "We are starting a new journey and this program will set a benchmark for our future way of doing business. We look forward to further leveraging our partnership with Wipro to gain competitive advantage." Mr Mittal said the industry in the past one year has witnessed slowdown in growth, as a result of the global crisis. Nasscom estimates for the IT-BPO industry for 2009-10, include export growth at 4-7% and domestic market growing at 15-18%. While uncertainty prevails, the sentiment now being reflected is that the worst of the crisis is over. “The industry has demonstrated maturity, resilience and enhanced efficiency. Of specific interest was the growth in domestic market, a three-fold growth in emerging verticals and geographies, enhanced globalisation and over 90% repeat business from clients in this tough environment,” he said. Mckinsey & Company in its report on the perspective of the IT industry by 2020 has given the current pace of reforms and expected constrains in talent and infrastructure supply, the exports component of the Indian IT industry is expected to reach $175 billion in revenues by 2020. The domestic component will contribute $50 billion in revenues by 2020, which is larger than the total exports revenues for India now. The Nasscom president said the during the recessionary period the IT industry has invested in new verticals and geographies, which would start yielding results shortly. “Continental Europe, Latin America, the Middle-East, Japan and Korea remain the new emerging markets for IT industry,” he said.